As a young boy I remember my Uncle Earl taking me on a tour through the Willits Bros. Canoe factory. The patented smell of cedar shavings mixed with the aroma of fresh salt air was empowering. Floyd built the hull on the 2nd floor. The canoe was then lowered to be trimmed out, finish sanded and varnished by Earl. The brothers kept meticulous handwritten notes ranging from financial figures to customer quotes to labor saving techniques, entries kept in log books, journals or spindled, as was the custom in those days. Today, the Canoe (game) Journal is used much differently. Instead of a factory, notes are entered after a stimulating game with a good friend, often over a cool drink in the summer; a brandy or glass of Bordeaux before a crackling fire in the winter. Settings vary from a ski lodge to beach house to private club, or anchored in a majestic cove. Canoe is all about “lifestyle”. The Canoe Journal offers a private place to write down great memories, keep running scores with close friends and track wins and losses, as well as the odd wager or two. It’s the perfect domain for logging brilliant tactics, strategies and winning moves. Many games down the road, when you are hunkered down on a rainy weekend, you will smile as you thumb through your notes depicting great games with old friends. A small leather journal speaking volumes. Side note: Thomas Jefferson kept a notebook while he was drafting the Declaration of Independence. Included were two entries: Lost at backgammon 7/6; Won at backgammon 7d/1/3. The cover is high quality soft leather cowhide. The Canoe shield has been heat embossed on the front panel. The journal is simple and rugged. Small enough to fit practically anywhere you travel. Players will soon find “journaling” part of the game. 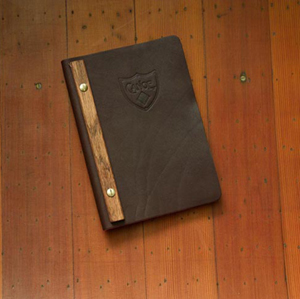 Material: Genuine leather, mahogany spine, brass hardware and 80 sheets of lined parchment paper. Refillable.